While iTunes Match was designed for matching music and providing cloud access to a music library, there are many audiobook listeners who might want to access their favorite books in the cloud. Doing so requires a bit of work, however; here’s how you can do it. First, whether you need to go to the trouble of setting up your audiobooks for iTunes Match depends on where you got them. If you bought them from the iTunes Store, you’re out of luck. Not only do audiobooks not show up in your purchased list, but since they are protected with DRM, you can’t convert the files (which is what I’m going to explain below) so they can be added to iCloud. 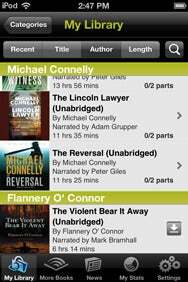 If you're an Audible customer, you can download and listen to any book in your library using Audible's iOS app. However, if you’re an Audible.com member, your entire audiobook library is already in the cloud. If you download the Audible app for iOS, then log in with your username and password, you’ll be able to download or stream any of the books you have purchased. If some or all of your audiobook collection comes from either CD rips, DRM-free downloads, or MP3 CDs (CDs that contain MP3 files), then there are some simple steps you can carry out to get your books to work with iTunes Match. There are two reason why iTunes Match doesn’t match your audiobooks. First, it doesn’t match anything in your Books library. And, second, even if your audiobooks are not in that library, iTunes Match won’t match anything that’s at a bit rate of less than 96 kbps. If you followed my instructions on ripping audiobooks, you almost certainly have books at less than 96 kbps. This makes sense, in order to save space, since audiobooks don’t need to be at a bit rate as high as music, and are usually very long. However, if you want to put your audiobooks in the cloud, you can start by ripping them—or at least the ones you want to have iTunes match—at 96 kbps. After doing so, make sure that you don’t select the tracks, press Command-I, go to the Options tab, and select Audiobook from the Media Kind menu. If you do this, the books will end up in the Books library, which iTunes Match ignores. 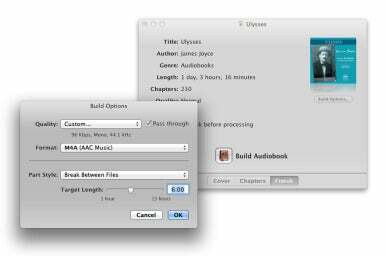 You can see that this files of audiobook, the Naxos Audiobooks recording of James Joyce's Ulysses, are "not eligible" for iTunes Match. Instead, leave them as music—which they will be by default when you rip a CD—and set their genre as Spoken Word or Audiobook. (If you have a lot of audiobooks, you can use more genres; just type in the ones you want, such as Fiction, Non-Fiction, History, Romance, and so on.) These files will get uploaded to iTunes Match, and you’ll be able to access them from other devices from their genre, or from the artist’s name (generally the author). If you have ripped audiobooks in your iTunes library at bit rates of less than 96 kbps, you have the option of up-sampling them. In other words, you can convert the files from their existing bit rates to 96 kbps, so you can use them with iTunes Match. To do so, go to the the General tab of iTunes’s preferences, then click on Import Settings. In the Import Using pop-up menu, you can choose either AAC Encoder or MP3 encoder; neither offers any particular advantage for use with iTunes Match. From the Setting pop-up menu, choose Custom, then use the following settings: Stereo Bit Rate: 96 kbps; Sample Rate: Auto; and Channels: Mono (unless you’ve ripped in stereo, such as for full-cast recordings). Then check Optimize For Voice, and click the OK button three times to save your changes and dismiss all windows. Now, select one of your audiobooks, no matter how many files you have. I recommend that you create a new playlist with these files; it will make it easier to delete them after you convert them. To do so, press Command-Shift-N, or choose File -> New Playlist from Selection. Go to that playlist, select the files, then choose Advanced -> Create AAC Version (if your import settings are for AAC files), or Advanced -> Create MP3 Version (if you chose the MP3 encoder). iTunes will start converting the files. This may take a while if you have a long book, or just a couple of minutes for shorter books. When iTunes has finished the conversion, you can do one of two things. First, you could delete the files you just converted, and keep only the 96-kbps versions. To do so, select the files in the playlist and click Option-Delete. A dialog box will ask if you want to delete the songs; click Delete Items. Splasm's Audiobook Builder can simplify some of the conversion needed to prepare audiobooks for iTunes Match, as well as join files so you have fewer files. The other option is to keep both sets of files—the ones at the lower bit rate for your iPod, say, and the higher bit rate files for iTunes Match. If you do this, I’d recommend tagging one set of files so it’s clear which is which. The easiest way is to select the files you just converted, press Command-I, and in the Album field, add something at the end of the album name, such as (low bit rate), or (iPod version). This means that each version of your audiobook will be a separate album, and you’ll be able to sync them easily. One other option is to use Splasm’s $10 Audiobook Builder. This application lets you join files together, but you can also change the bit rate when doing so. After you’ve created what the program calls a project, click Build Options below the cover image in the Finish tab, or go to Audiobook -> Build Options, and click the Quality pop-up menu and select Custom. Set Data Rate to 96 kbps; Channels to Mono; and Sample Rate to 44.1 kHz. Click OK, and in the Format pop-up menu, choose as M4A (AAC Music). Audiobook Builder will join and convert the files. Add them to your iTunes library, and match away. With this technique, you can put audiobooks in the cloud for listening whenever you want. It’s limited to books you have on CD or in DRM-free files, but if you’re a big fan of audiobooks, you probably have a lot of these.